ESO 77-14 (ESO 077-IG014, or AM 2317-692) is a pair of similar-sized interacting spiral galaxies, located about 550 million light-years away in the southern constellation of Indus (the Indian). The pair is moving away from us at a speed of over 12,000 kilometers per second. Interacting galaxies are found throughout the Universe, sometimes dramatic collisions that trigger bursts of star formation, on other occasions as stealthy mergers that form new galaxies. ESO 77-14 belongs to the first category. 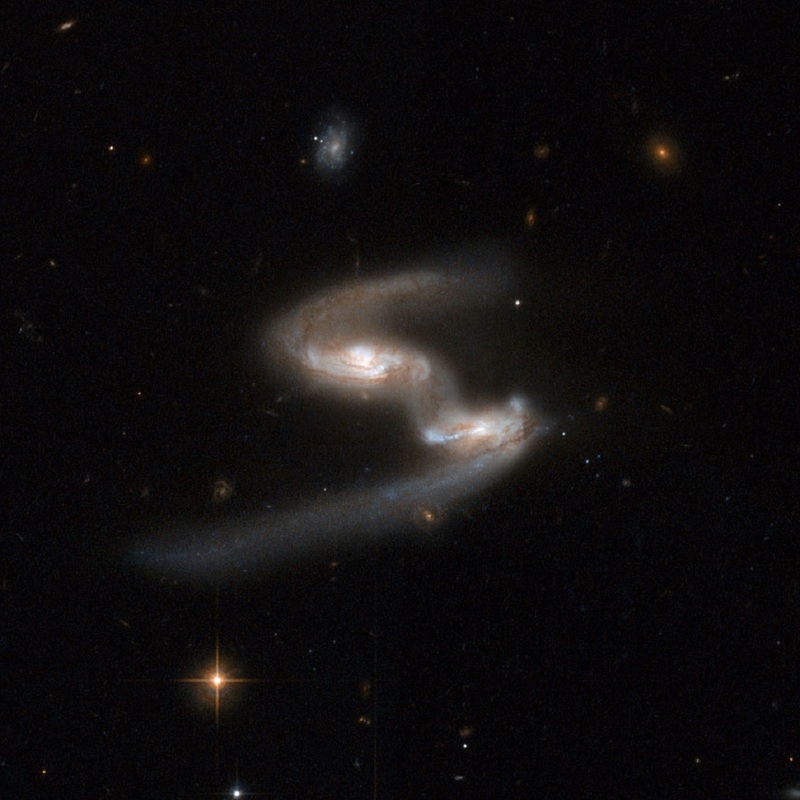 The two galaxies, which are spinning each other around in a celestial dance, have linked arms; a bridge of gas and dust connects the two like siamese twins. The gravitational interaction is also causing the disruption of their main bodies. The galaxy on the right has a long, bluish arm while its companion has a shorter, redder arm. The dust lanes between the two galaxy centers show the extent of the distortion to the originally flat disks that have been pulled into three-dimensional shapes. Galaxy mergers, which were more common in the early Universe than they are today, are thought to be one of the main driving forces for cosmic evolution, turning on quasars, sparking frenetic star births and explosive stellar deaths. Even apparently isolated galaxies will show signs in their internal structure that they have experienced one or more mergers in their past. This image was created using the Hubble Space Telescope.